The Spaniard took the exit hours later than planned while his mechanics arranged the hydraulic circuits, contaminated with earth. In a desert bivouac, with all the participants in competition, patient Sainz waited in front of his car with the unbuttoned suit. There were only a couple of mechanics with desperate calm around a disassembled Mini and there were a few minutes left for the closing control, the disqualification was a matter of time. Then the man from Madrid came to talk, he did not look good. "What are you going to do?" 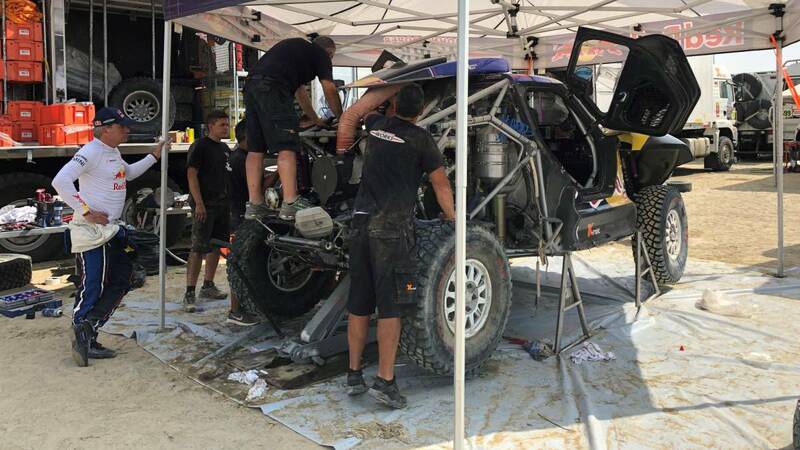 The ears were preparing to hear first-hand the news of the abandonment when the still-active Dakar champion, seriously, said: "We have an hour since the last car leaves to go out to the special and that's what we're going to try. " With nothing to prove at 56 and no partners to help, because he left Peterhansel after an accident in which his co-pilot, Castera, was injured. But the Madrid refused to leave although the race this time has been elusive. The previous day had 230 kilometers without power steering and this Wednesday they found out the reason: a flange introduced dirt into the hydraulic pipes that activate the jacks or operate the address, they were totally contaminated and had to change all the pipes and resituar the take above. But three hours later than planned, and eight minutes before the limit, Sainz and Cruz jumped on the JCW Buggy and marched to a special that They would have walked all the participants before them, in the middle of the peloton. He made the sixth fastest time. He won the stage Al Attiyah, virtual champion. Nani consolidated the second 'box' of the podium and Loeb the third, despite being stopped more than an hour because of problems in his Peugeot.